← Who is Hatsune Miku? Your HOTMAIL details are required for account upgrade. Incomplete details and wrong passwords forwarded may result in account closure for security reasons. Kindly confirm by filling the information’s below urgently for the exercise upon receipt of this notification to avoid deactivation. We’ll keep making HOTMAIL Account the best email service around. This email made my brain freeze for a few seconds for a simple reason: This email is not in my “Junk” folder. A quick glance at the “sender” box at the top shows that the sender is a “Windows Live Team”….. which makes no sense. Putting my mouse over the “Window Live Team” link shows the true nature of the sender…. The sender’s email address is actually “me_1811@hotmail.com”. With this in mind, I started punching the email into the “Google toolbar”, but it yielded strange results. Without any leads from the email address, I tried the keywords, “Windows Closure Alert”, and immediately, the first result caught my eyes. 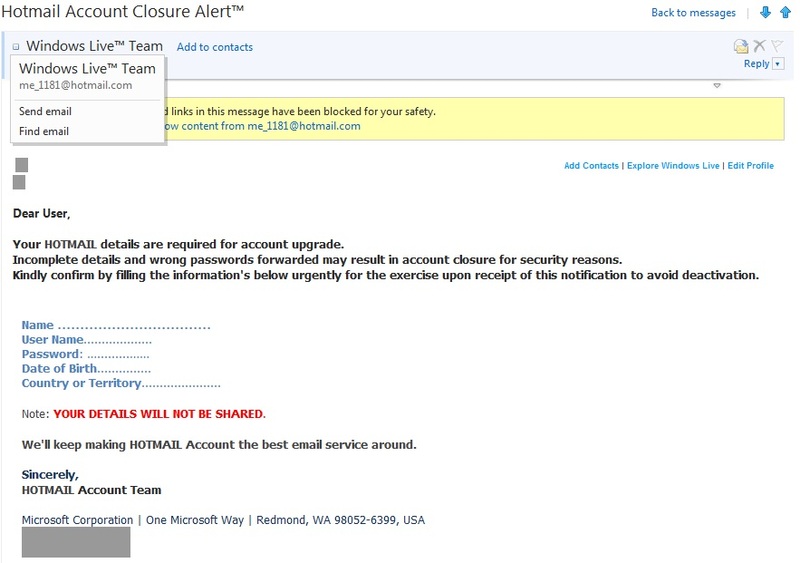 It was a page from Hoax-Slayer, titled “Hotmail Account Closure Phishing Scam“. From the email, I found a few other variations of the same phishing email, and an issue immediately caught my eyes: the email of the sender kept changing. So it seems that, someone is stealing accounts from people, and using them to escape the “SPAM filter” of the Hotmail Webmail server. Since the sender’s email changes every now and then, the email was not block, and landed nicely into the “Inbox” of victims. And according to the comments on the page at Hoax-Slayer, a stolen account had its email password changed, which means that the email might be gone forever. This might cause serious problems as the email account of a person might be linked to other important accounts, like the banks’ account or a person’s work email. This entry was posted in Technology and tagged Hoax, Hotmail, Hotmail Account Closure, Hotmail Account Closure Hoax, phishing, Windows, Windows Live Team. Bookmark the permalink.